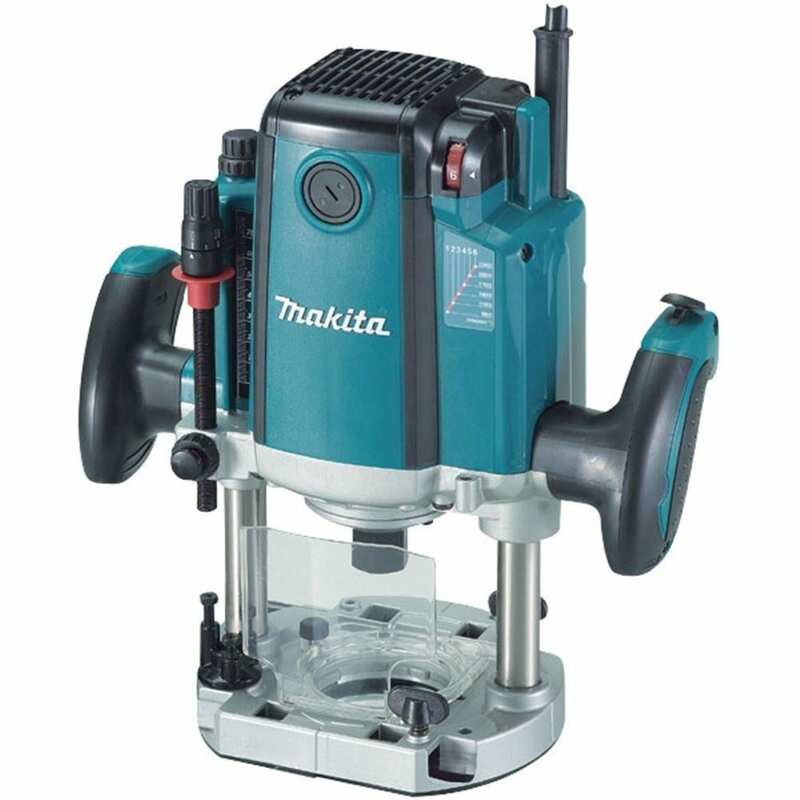 A good full-size plunge router like Makita’s RP2301FC is one of the best tools you can possibly own. It is big and heavy but all that size and weight come with superior performance. It can do a great deal and can be useful in a wide variety of projects. The purpose of this review is to give you enough information about this router, together with other details you may find useful when evaluating plunge routers in general. The LEDs, chip deflector, and labyrinth fan are nice additions that help a lot. The high-performance motor and the variable speed and depth settings allow for versatility. Replacement parts are difficult to get. When it comes to routers, there is often an issue about how palm and mid-size routers are getting so powerful that they can pretty much already do nearly everything bigger routers can. While that is true, it is not enough reason not to have a full-size router in your shop. No matter how powerful smaller routers get, their performance will never equal that of full-size routers like the RP2301FC. Aside from the fact that it is made by a trusted name in power tools, this router comes packed with features that improve what a plunge router already does well. The RP2301FC is for the all-around woodworker who encounters a lot of heavy-duty work daily. This router is capable of making anything from cabinets, doors, windows, and a lot more. Despite being a heavyweight both in actual weight and in power, the RP2301FC does a lot to keep comfort, convenience, and ease of use at a maximum. It has a lot of features in place to ensure that you do not feel the fatigue caused by working with such a highly powerful motor. Because of its versatility, the RP2301FC is an ideal tool for making a large selection of projects and will definitely benefit the busiest woodworkers out there. When we say speed control, we are talking either fixed or single-speed routers or variable speed routers. A single-speed router cuts at a constant speed all the time, regardless of what you are cutting or what bit you are using. Single-speed routers are good for use if your routing work is mostly focused on just one material or bit size. Variable speed routers allow you to adjust their cutting speed. You will find that useful if you work with a diverse set of materials and bits. You can speed the router up if you are working with a relatively easy material to work with like pine or slow down if you are plunging through denser materials. The other benefit of variable speed control is safety. The larger your bit, the slower you want your router to be to avoid causing accidents. Meanwhile, small bits measuring 1 in for example can be run at top speed without any problems. A plunge router’s speed range directly affects your cutting speed and the kinds of bits you can use. The higher your speed, the faster your cut. On the other hand, the lower speed limit determines the largest bit size you can use while the top speed determines the smallest bit size permissible. Plunge depth is mainly for versatility. The deeper your router’s plunge is, the more you can do with it. However, you do not necessarily have to find the router with the deepest plunge. Ultimately you only have to find one that can give you the depths you need for your usual projects. Check each router for features that can make work and life easier. These include tool-free bit change mechanisms, LED lights, handle design, adjustment knobs, triggers, chip deflectors, and more. These features may not sound like a lot on paper, but they sure make the exhausting job of routing a lot less stressful. The RP2301FC runs on a soft start 3.25-hp, 15-amp motor with an electronic variable speed range of 9,000-22,000 rpm. It also has a fully adjustable plunge depth range of 0-2 ¾ in. The depth of cut can be quickly and easily adjusted using a knob and highly visible preset depth stop markings. This plunge-base router is made of oversized ball bearing construction and has linear ball bearings that provide smooth plunging action. In addition, it has a built-in fan that is designed to keep dust out of the router, preserving its life. Nearly every step has been made to make this router as easy and comfortable to use as possible. The handles are rubberized and ergonomically designed to let you have a better grip and control. There is an easily accessible lock-on switch that you may find useful when routing for long periods. Furthermore, it boasts a tool-free template guide system, a chip deflector that works in tandem with the fan, and built-in twin LEDs that enhance visibility. You will rarely find a plunge-base router with more power than the RP2301FC’s 15-amp, 3.25-hp motor. With this amount of power, this router can work on the toughest applications on the hardest materials for prolonged periods of time without the slightest risk of bogging down. This is one of the things that keep full-size routers like the RP2301FC above smaller ones. You simply can’t put all that power in a smaller package. Upon activation, the RP2301FC will not run at the chosen speed right away. Instead, it will start “softly,” meaning it will start at a slower speed then gradually accelerate until it reaches your desired speed. Soft start enables you to ease into difficult cuts without the risk of accidentally ruining your material because of the sudden blast of power. Also, since there is no sudden jolt upon turning on the router (especially if you are using it freehand), the risk of injury is minimized. The RP2301FC’s lowest speed setting is 9,000 rpm, which is within the safe speed range for large bits measuring 2.5 to 3.5 in. The highest speed setting, on the other hand, is 22,000 rpm, which you may use for small bits measuring 1 in. This wide speed range enables you to work with nearly all bits available, making it possible for you to create any design or cut. We were curious as to what other users think of the RP2301FC so we scoured some review sites and looked at what others consider to be this router’s hits and misses. It looks like the RP2301FC is doing just fine, judging by the mostly positive feedback it is getting. Many of the positive comments revolve around the router’s smooth plunge, ergonomic design, and good overall performance, especially in heavy-duty tasks. Many of the negative reviews are about faulty parts and the subsequent after-sales support and parts availability. A number of users said that replacement parts are hard to come by. Overall, though, the RP2301FC is still a winner, which is exactly what is expected of such a brand as Makita. The DW625’s speed range is only slightly wider than that of the RP2301FC, with the lowest setting being 8,000 rpm and the highest, 22,000 rpm. It also has electronic speed control, which keeps the router cutting at a constant speed even with changes in its load. Plunge depth is easily adjusted down to micro-fine increments using the router’s unique rack and pinion mechanism. Measuring 5 ⅝ x 11/16 in and weighing 11.2 lbs, the DW625 also offers magnified scale for enhanced visibility. This plunge-base router from renowned power tool maker Bosch has a 3.75-in base opening which allows it to tackle different applications. The 1619EVS makes depth adjustment plain and simple with their own system. Its soft start motor has electronic feedback, letting it cut at a constant speed despite varying loads. The variable speed range is 8,000 to 21,000 rpm and the router has a dual-bearing plunge post that provides smooth and precise plunges. Finally, it has a spindle lock for easy bit changes. The RP1800 is unique in that it has a fixed variable speed of 22,000 rpm, making this router an ideal choice of a tool if you constantly work with the same bit sizes and material types. Its depth range is a good 2.75 in. In addition, Makita has put a quick-release depth adjuster and a shaft lock, allowing you to work more and fumble less. Other features worth mentioning include a fan and a chip deflector for keeping dust away, a lock-on trigger which is useful if you will be working for long periods, an extended depth control knob for use under the table, and double insulation. The M12V2 has a soft start variable speed motor with electronic feedback. The speed control trigger conveniently juts out of the handle where it is most accessible to you. The variable speed range is 8,000 to 22,000 rpm, which is about the widest range you can get on any router today. With that range, you can work with bits as big as 3.25-in and those as small as 1 in. Some of the other features include a dust guide, a micro-fine depth adjustment knob, an optimized chuck design, and elastomer-coated handles. Like the RP2301FC, the Speedmatic has an ultra-powerful 15-amp, 3.25-in motor that can attack any routing operation without showing any sign of conking out. Although its speed is variable, it is not fully adjustable. There are five preset speed settings that you can switch to depending on what size bit you are working with. Two features unique to the Speedmatic are the adjustable depth stop turret and the auto-release collet. Together, they greatly enhance ease of use and reduce downtime. It has a powerful motor that can work on the most difficult applications for long hours on a daily basis and a wide variable speed range that offer a lot of possibilities in terms of output. The comfort and ease-of-use features seem to have been planned and designed well, too. Overall, I recommend this plunge router (click here for lowest price online) for your next woodworking project.